Hi, all of you BERNINA enthusiasts! I hope you had a happy Thanksgiving and slipped in some sewing, too! These past few months I’ve had the good fortune to debut two new embroidery/quilting classes on Craftsy, one starring the BERNINA 780 and one starring the BERNINA 580. The class projects can be stitched on other machines, too, but these are the machines I sew on in my studio and I am so excited to share techniques that I have learned with other embroidery and quilting enthusiasts! 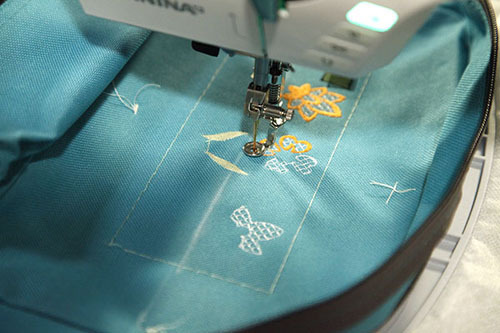 First: Elegant Machine-Embroidered Bags, starring the BERNINA 780. This machine is so quiet I could talk while the machine ran on camera! And the large bobbin only had to be refilled once!!! We talk a lot about how to handle hard-to-hoop items in this class. You know the kind I’m talking about – backpacks, tote bags, labels, and so on are tough to wrangle into the hoop and under the presser foot. Me with the star of the show, the BERNINA 780. Love it! 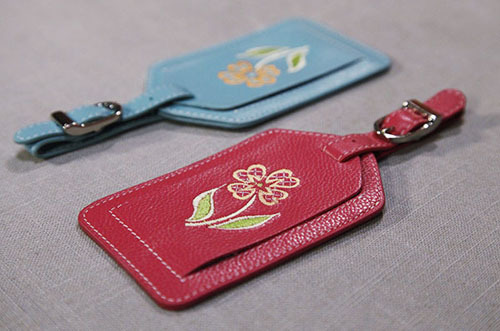 We start off embroidering some pre-made luggage tags. One of my students is embroidering these as stocking stuffers for every member of her family! Embroidering a pre-made canvas bag. Learning to double-hoop a design as we make a custom canvas tote. Embroidering a normal backpack. This would be a terrific gift for a school-age child on your holiday gift list. An assortment of finished class projects. 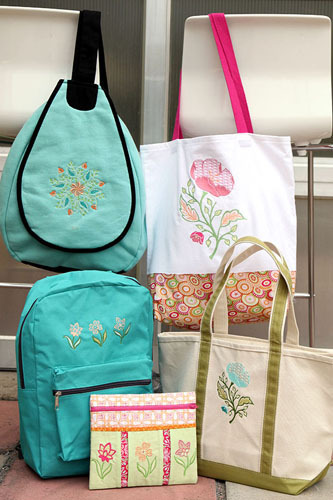 Clockwise from top left: Embroidered Medallion on a pre-made backpack, a custom-sewn canvas tote with coordinating fabric panel, a pre-made canvas tote, a zippered clutch with three embroidery motifs, and a pre-made embroidered backpack. 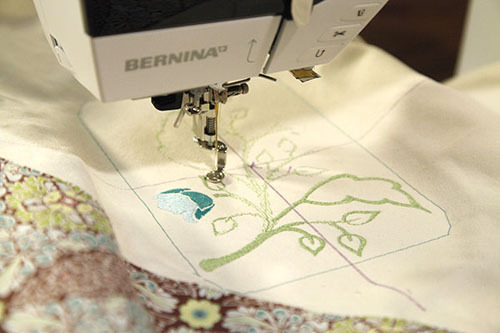 Two: Elegant Machine-Embroidered Quilts, starring the BERNINA 580. In this class I talk about different ways to incorporate embroidery into quilting to add detail and personality to projects. It was so much fun! 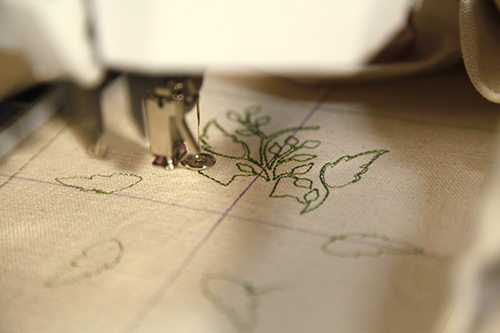 All the on-camera stitching was done on the BERNINA 580; the samples were made on the BERNINA 580 and 780. Shopping for thread is as much fun as shopping for fabric, don’t you think? All of the my class quilts were pieced with Aurifil thread, then quilted with Aurifil 50 wt. cotton and So Fine 50 wt. polyester. I used Isacord embroidery thread for all of the embroidery. And all the projects have Warm & White Batting inside. 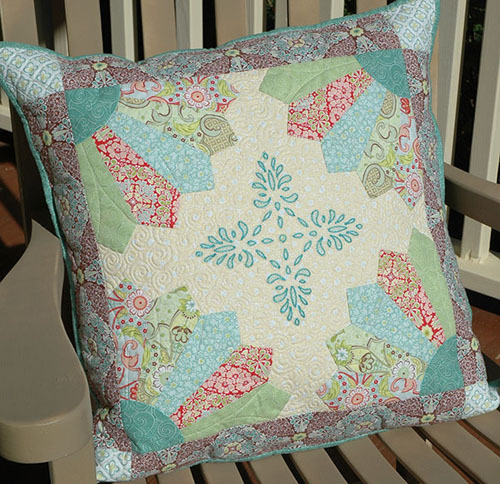 Here are some of the projects from Elegant Machine Embroidered Quilts. All embroidery files are included with the class so students can make their own versions at home with their own choice of fabric and thread. 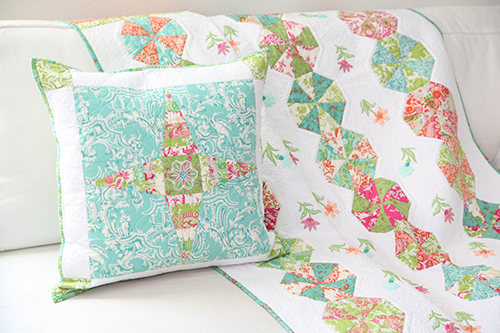 North Star Pillow and Garden Walk Quilt, both sewn in Chinoiserie by Anna Griffin. Detail of embroidered medallion on North Star Pillow. 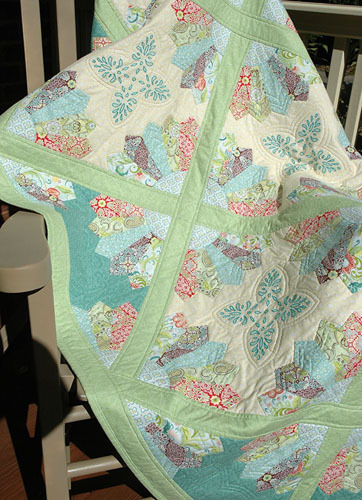 The Garden Walk Quilt was quilted by Cherry Guidry of Cherry Blossoms Quilting Studio. 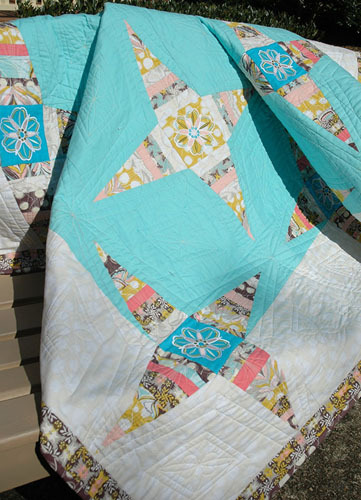 North Star Quilt, sewn in Kona cotton Sardinia by Jessica Swift for Blend Fabric. 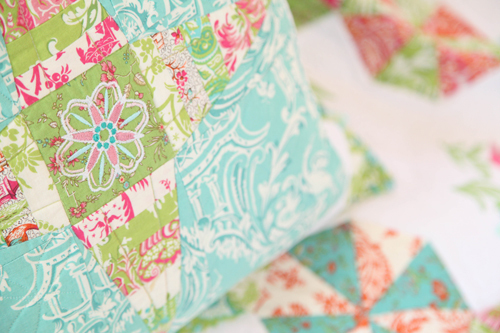 Dresdens on embroidered background fabrics in this Radiance Pillow in my Bonjour Mon Ami Fabric. 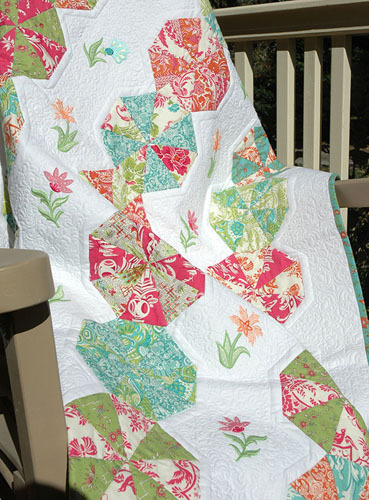 Radiance Quilt, quilted by Jenn Reeve of Honu Quilting. You can do so, so much with these machines. The best part for me has been seeing what students create! 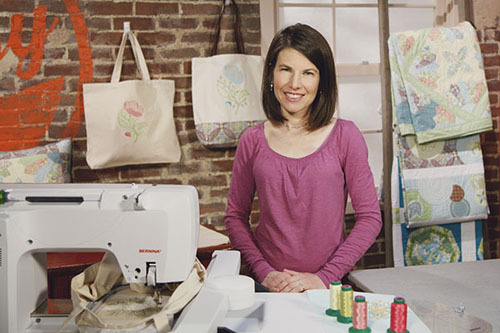 Next Next post: WeAllSew Celebrates Our Loyal Fans: 66,000 Likes! I have a BERNINA Art 630 it would be great to see information on this machine particularly on the embroidery is that at all possible. I hope you can help with this.